Traditional soil sampling processes are slow and expensive: gathering soil samples, preparing them for analysis, sending them to the lab, and waiting for their return. As a result, very few locations in the United States, let alone the rest of the world, have accurate soil maps. As concerns grow about more efficient agricultural practices, the effects of climate change, over- fertilization with chemicals, erosion, and pollution, the availability of field spectrometry for soil science becomes increasingly popular. In addition, a field spectrometer or spectroradiometer offers the possibility of accurately categorizing soil/land changes over a large area. NIR reflectance spectroscopy performed in the field offers a relatively simple, non-destructive, reliable, inexpensive, fast, and accurate method for characterizing soil. Sample preparation involves only air drying and crushing/grinding, analysis won’t change or affect the sample in any way, no chemicals or hazardous materials are used, measurements are very fast, and several different soil characteristics can be gleaned from a single scan. Testing can be performed in a lab, or more effectively, in situ. Spectral signatures of materials are defined by reflectance or absorption as a function of wavelength. NIR spectroscopy measures the reflectance of infrared light wavelengths for samples and the shapes of the soil spectra correspond to mineral composition, organic matter, clay content, water, iron form and amount, salinity, and particle size distribution. Depending on what’s in the soil, individual molecular bonds vibrate and absorb light with a specific energy quantum related to the difference between two energy levels. The energy quantum is directly related to frequency and inversely related to wavelength. The resulting absorption spectrum produces a characteristic shape that can be used for analysis. The data collected can provide a picture of soil health and fertility for food source management and security, as well as natural resource management and land conservation/development. 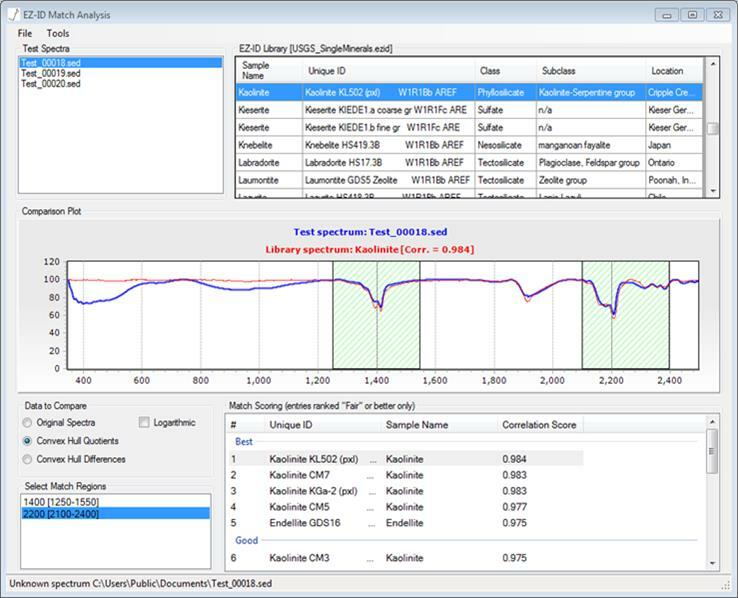 Spectral libraries continue to be built to allow calibrations to be based on a small number of samples and then applied in the rapid analysis of large numbers. For example, in one field application, 800 spectra were collected in samples from the Railroad Valley Playa in Nevada in one day, using a SPECTRAL EVOLUTION PSR-3500 field spectroradiometer with a standard four degree field of view lens from a distance of one meter. 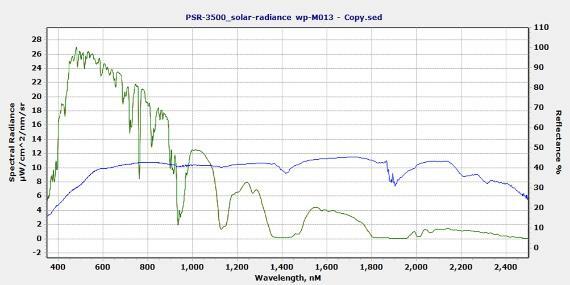 Solar radiance of the reflected light was also captured in the same measurement. The spectra collected can be analyzed using a range of third party analysis and chemometric packages, including GRAMS, The Spectral Geologist (TSG), R, Unscrambler and others. These software products are used for geochemical analysis and interpretation of basic soil composition, especially organic matter, texture, clay mineralogy, nutrient availability, fertility, structure, and even microbial activity. SPECTRAL EVOLUTION’S DARWin SP Data Acquisition software saves your spectra as ASCII files for use with analysis software. In addition DARWin SP includes our EZ-ID sample identification software that matches a target spectra against a library of known spectra. Or if you want to build a custom soils library, EZ-ID offers the fast and easy-to-use Custom Library Builder module. Click here to see our EZ-ID sample identification software and Custom Library Builder module. 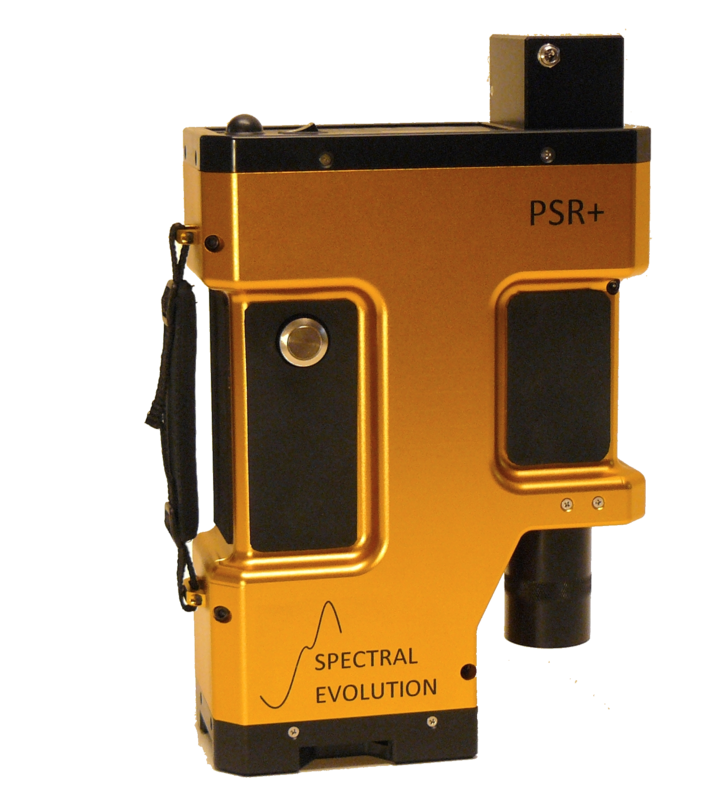 SPECTRAL EVOLUTION’s PSR+ 3500, RS-3500 and RS-5400 lightweight battery operated portable spectroradiometers are ideal for soil studies, including topsoil fertility. 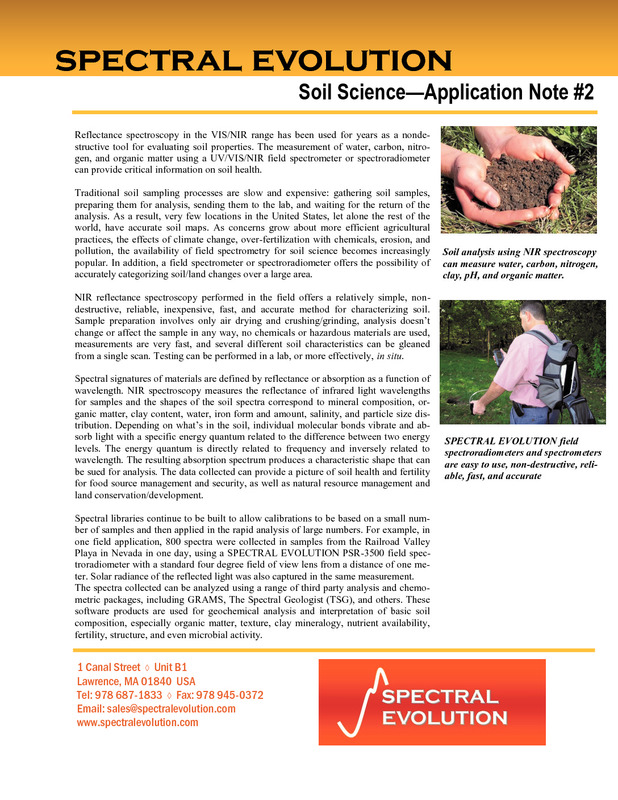 UV/VIS/NIR reflectance spectroscopy satisfies the researchers need for speed and precision in the estimation of soil carbon and other soil properties. Used both in the field and in the lab, these spectroradiometers and spectrometers allow for studies that can measure the effects of climate change, the increasing impact of fertilizers in the soil, soil mapping, and other critical land changes without the need for sample preparation. 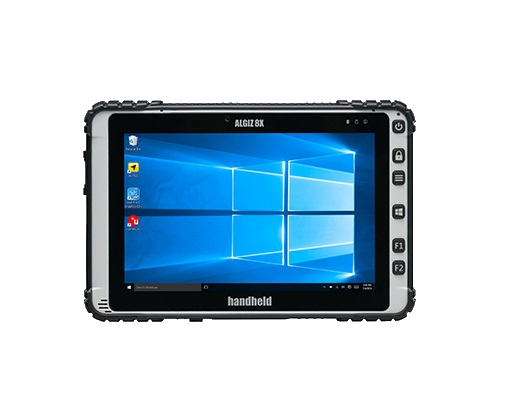 True handheld convenience for field work or remote sensing! Every SPECTRAL EVOLUTION handheld spectrometer can be controlled with a laptop or rugged handheld tablet. 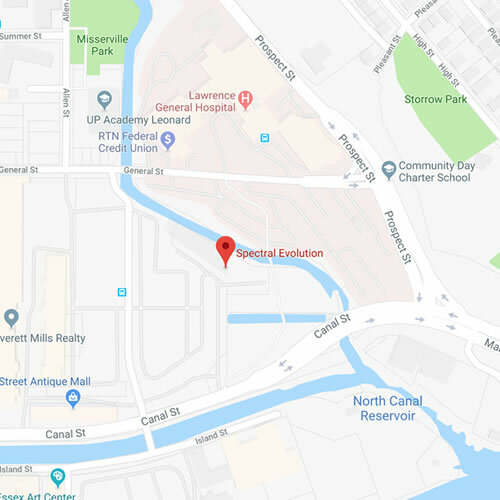 Its DARWin LT Data Acquisition software permits rapid analysis of mobile data and can be used to trigger data collection remotely.SPECTRAL EVOLUTION offers the ALGIZ 8X rugged handheld tablet preloaded with all necessary software to run all Bluetooth enabled SPECTRAL EVOLUTION Spectrometers. The tablet can be used to tag scans with GPS coordinates and pictures of samples. The display can even be viewed in direct sunlight! For information on our Remote Sensing Accessories, Click Here. To download our flyer, click here.